PRICE IS AFTER ALL REBATES. NO ADDED FEES! The Aprilia Dorsoduro 750 is equipped with the best braking technology currently available. The front brakes feature 4-piston radial calipers, state-of-the-art for the motard market. The light weight, 320 mm wave discs ensure shorter than ever stopping distances. The bikes aggressive stopping power is emphasized by the mean look of the braking system, in keeping with the Dorsoduros overall styling. A sophisticated two channel Continental ABS system provides maximum active safety on the Dorsoduro 750. The ABS controller is specially calibrated to make full use of the Dorsoduros impressive braking power and tire grip on dry surfaces. Riders can therefore still enjoy this amazing fun bike to the full. Numerous improvements have been made to the Aprilia 750 cc, 90 V twin engine, which now features mapping specially developed to bring out the Dorsoduros aggressive character. Improvements have been made to various areas of the749.9 cc engine with its bore and stroke of 92 x 56.4 mm. As a result the electronic and mechanical content of this V twin engine sets new standards not only for engines of this size but for many far larger units too. The electronic engine management on the Dorsoduro 750s engine leads the field in technology and performance. The Dorsoduro features a second generation electronic throttle with Tri-Map selectable triple mapping. Three performance modes, Sport, Touring and Rain, can be selected from a switch on the handlebars (with the throttle closed for safety reasons). The Dorsoduro changes its character radically, depending on what mode you select. Sport mode gives you aggressive instant power; Touring mode gives you a smoother action, better suited to relaxed long distance riding; and Rain mode gives you ultimate safety slippery surfaces. The Tri-Map electronic throttle also means smoother, more consistent power thanks to more accurate and precise throttle control based on parameters including engine speed, gear selection, air flow, throttle position and temperature. Whatever mapping you select, the engine is always ready to deliver the best possible performance in terms of acceleration and rev range, giving you an amazingly satisfying and entertaining ride. Thanks to its advanced electronic and mechanical technology, the Aprilia V twin engine develops 92 HP at 8,750 rpm and a maximum torque of82 Nm at 4,500rpm. These figures enable the Dorsoduro to compete directly with motorcycles powered by far bigger engines. The Aprilia Dorsoduro 750 is also available, right from its introduction, in a restricted25 kW version. The use of a ride-by-wire electronic throttle has allowed Aprilia to avoid cutting power right across the range, as happens with less advanced restricted versions. Instead, the power curve of the restricted Dorsoduro is identical to that of its full-power sister right up to the point where the permitted power limit is reached. The 25 kW Dorsoduro 750 therefore delivers far superior acceleration to the equivalent models of the competition, to the benefit of riding satisfaction and pleasure. Aprilia motorcycles have always been acclaimed for the excellent chassis designs. The Dorsoduro 750is no exception, thanks to a chassis that makes it the best balanced and most effective bike of its type. The new Dorsoduro is easy and intuitive to ride despite its blistering performance. It is designed to be ridden at the limit under all conditions, to perform extreme power slides, and to blast out of bends under full power. The secret lies in an ultra-responsive chassis, whose ergonomics suit riders of all statures and allow you to take it to the limit and enjoy the thrills of a motorcycle built for pure entertainment. The frame incorporates all of Aprilia's vast racing experience, and makes full use of the latest mixed steel and aluminum designs derived from the world of Super motard World Championship racing. The top half of the frame is a tubular steel trellis. This is secured to generous aluminum side members by special high strength bolts. The resulting structure is extremely rigid and light weight, and provides the best possible means of harnessing the exuberant power of the Aprilia V90 engine while still communicating a strong impression of lightness, high technology and Italian style. Continuous co-operation between engine and frame designers has led to the perfection of high-tech, performance-oriented solutions and to total integration between engine and frame. The intelligent design solutions applied to Aprilia's V twin engine have made it shorter than ever, permitting the development of a rational and efficient frame and a superbly agile and incredibly responsive motorcycle. The lateral position and acute angle of the rear monoshock has freed up the space needed to ensure optimum exhaust geometry without any increase in the bikes overall length, and without subjecting the monoshock to thermal stress. The aluminum swingarm is robust enough to withstand the asymmetric stresses generated by the lateral positioning of the rear suspension. 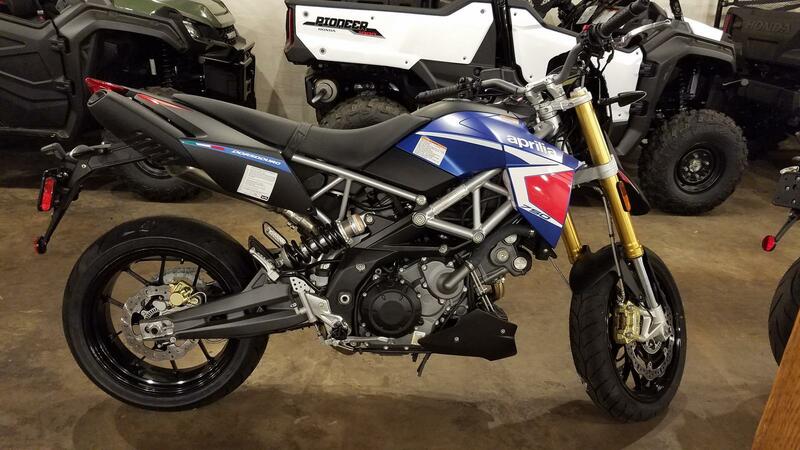 The swingarm has been specially developed to satisfy the needs of a supermotard like the Dorsoduro 750, and combines excellent torsional rigidity with the elasticity needed for precision under acceleration and intuitive control under changing conditions. The optimal definition of suspension has always been the pride of Aprilia designers and the Aprilia test team. The 43 mm upside-down front fork with shell-cast feet has spring preload and hydraulic brake adjustable in extension. The lateral shock absorber with is directly hinged to the swingarm in a cantilever configuration and has adjustable spring preload and hydraulic return; the front and rear wheel travel is 160 mm, which is also in line with the superbike philosophy that requires effective and controlled but long stroke suspension. Both steering yokes are forged, the upper also anodised, as a demonstration of the excellent level of finish of the Dorsoduro. The 4-piston radial caliper front brake system represents the current state of the art for a bike of this segment. The 320 mm floating wave discs are lightweight, ensure shorter stopping distances and underline the aggressiveness of braking thanks an incisive cool look, in line with the overall style of the Dorsoduro 750 ABS. Also the 240 mm rear disc is “wave” and braked by a single piston caliper. Both the front and rear systems use braided metal aeronautical type hoses to ensure maximum performance, even under stress. A sophisticated two channel Continental ABS system increases the safety level of the bike. Its specific calibration lets you to take full advantage of the sporting character of the Dorsoduro 750. Engine type: Aprilia V90 four-stroke longitudinal 90° V-twin engine, withliquid cooling, double overhead camshafts driven by mixed gear/chain timing system, four valves per cylinder and Ride by Wire throttle control. Front suspension: Ø43 mm upside-down fork, with adjustable hydraulic rebound damping and spring preload. Wheel travel 160 mm. Front brake: Dual Ø320 mm stainless steel floating wave discs. Four piston radial callipers. Metal braided brake lines. Rear brake: Ø240 mm stainless steel wave disc. Single piston calliper. Metal braided brake lines. Aprilia V90 four-stroke longitudinal 90 deg. V-twin engine, double overhead camshafts driven by mixed gear/chain timing system, four valves per cylinder and Ride by Wire throttle control. Ø43 mm upside-down fork, with adjustable hydraulic rebound damping and spring preload. Wheel travel 160 mm. Aluminium alloy swingarm. Hydraulic shock absorber, with adjustable rebound and preload. Wheel travel 155 mm. Dual Ø320 mm stainless steel floating wave discs. Four piston radial callipers. Metal braided brake lines. Ø240 mm stainless steel wave disc. Single piston calliper. Metal braided brake lines.